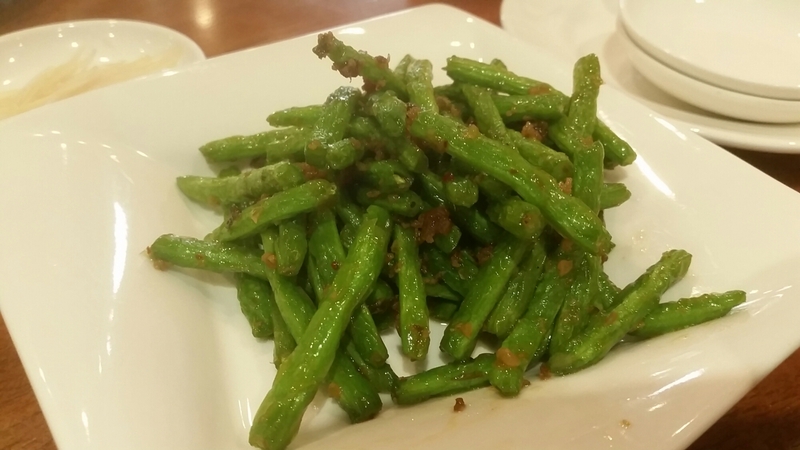 Hot Days & Nights: Dear Taipei, I Love Your Amazing Food! I really had no preconceived notions about Taipei. In fact, I had never even had Taiwanese food before going on this trip; apart from the Taiwanese born bakery 85c which has sprung up locations all over southern California. Maybe that was a blessing in disguise? I was pleasantly surprised with both street food and some of the restaurants we visited. If I’m ever back in Asia I would absolutely love to have another layover in Taipei so I could experience more of mouth watering Taiwanese food. One of the best things I had the entire trip was at a famous restaurant called Din Tai Fung. After a visit to Taipei’s 101 landmark, we headed down to the restaurant located within that same building. There wasn’t much of a wait when we went, maybe about 20 minutes. This was great because it gave us time to decide on our meal. We ordered a few things to share; shrimp shumai, pork xiao long bao, garlic green beans, and the most wonderful and delicious truffle and pork xiao long bao. 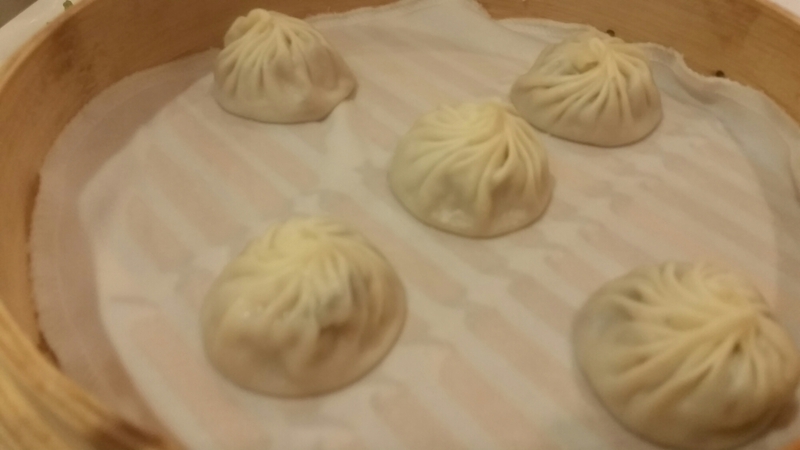 By far, the savory and juicy taste of the truffle and pork xiao long bao was in my top 3 of best foods for Taipei. It is a must try if you go here!!! After coming back, I had learned that there’s a Din Tai Fung in L.A., but the truffle and pork (5 piece) dish here was $30. Outrageous, considering I had paid $30 for my entire meal at the Taipei location!!! We stayed at lovely hotel right by the trendy area of Ximending. The area is absolutely lively; full of shops, street food, performers, and crowds. Since we were in Taipei for such a short time, it was nice to have direct access to an area compact with all of these things. All we had to do was step outside, turn right, and there we were at the entrance of Ximending’s main shopping district. You can probably tell by the title of this post that Taipei was one of the hottest and muggiest places I have traveled to so far. I mean I would step outside my hotel and be drenched not mere minutes later! Ha! With that in mind, this lovely little shop that sold so many varieties of cool and refreshing drinks with boba was my saving grace. They had so many options, and you can totally customize your drink; from the flavor, amount of ice, boba or jelly, and sweetness. Since I am so devoted to Yakult I was surprised they had a drink that like the one I had in the picture below. 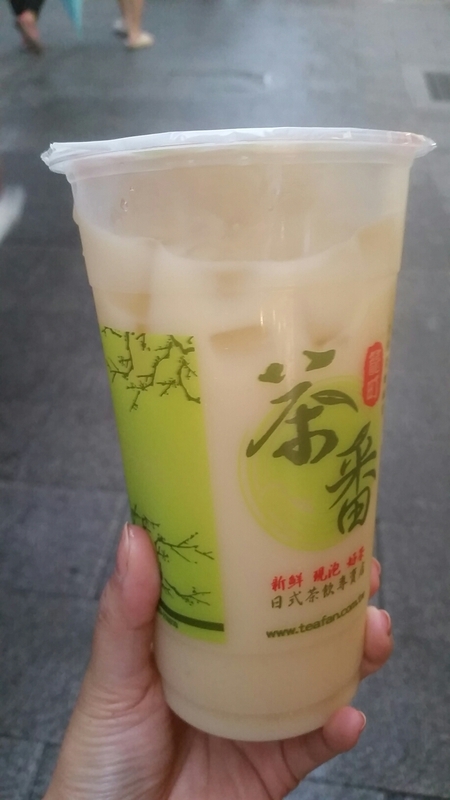 I had a green tea and Yakult iced drink….absolutely loved it. It was refreshing on such a warm day! Now here’s another famous food I had heard about; hot star fried chicken (located in the Ximending area). And yes folks, that piece of chicken is almost larger than my entire face. Let’s take a moment to appreciate that……. The hot star fried chicken was pretty good. Quite juicy inside for something that was fried, and the seasoning on it just made it even better. Now there is one last and final dish I had in Taipei; that to this day I still salivate and dream about…..beef noodle soup. Beef noodle soup is just what it sounds like, but just imagine freshly made noodles in a savory deep red broth filled to the brim with fall apart beef. Yes, this was the BEST DISH EVER on the trip. Why don’t I have a picture you may ask? Well, it’s a combo of 2 things really. Firstly the place we went to was a local type of place (one without a sign even), and no pictures were allowed. Literally a sign out front of the store. The second reason you ask? Second reason was that I devoured my food nonstop when it had arrived. I was planning on sneating pictures of just my bowl, but I couldn’t stop eating it once I had started (something I never do)! 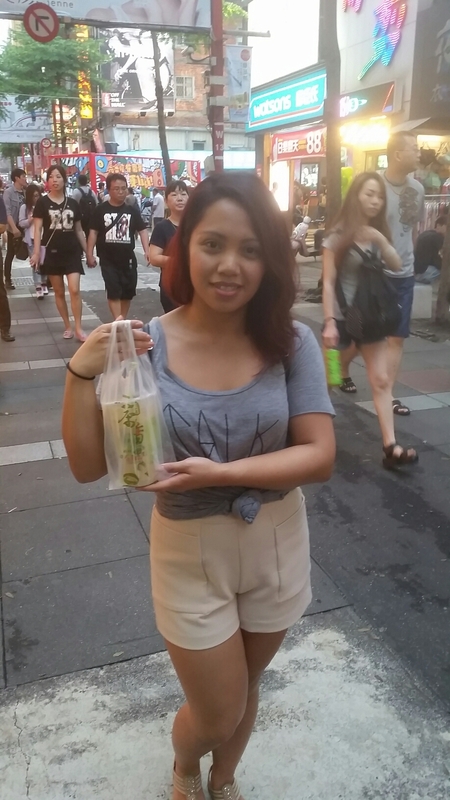 So to recap again, overall I was so pleasantly surprised about the food in Taipei. I’m glad I was able to do a bit of research beforehand and find recommended eats. Taipei is a place for foodies and people who just enjoy to eat good food. I hope you enjoyed and aren’t drooling too much over there (cause I sure am). Until next time….see you in the next post! !